Spring is a time to wipe off the grime of winter and start the freshness anew. Take your average spring cleaning schedule a step further by giving your vinyl wrap some TLC. Whether you have a truck wrap, car wrap, or a fleet of vehicles, there are some maintenance tips that we think you should practice this year. Check out our checklist to ensure that your wrap stays in top shape for the sunny seasons. Regardless of the time of year, your ride should always be a clean one from the inside, out. At SkinzWraps, Inc. we know beauty is skin deep, but we love to make the exterior of your vehicle look great with a color-changing wrap. 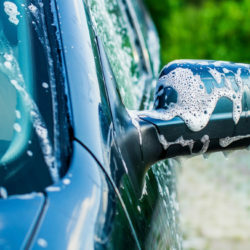 If it’s time to wash your wrapped vehicle, make sure you’re doing it the right way. The last thing you want is to damage your wrap by washing with the wrong methods. We suggest hand washing your car with clean water and mild soap. If you have concerns about what types of soaps are easy on your wrap, reach out to an experienced wrap installer with your questions! Both of these options can damage your wrap and cause premature dulling and fading to the product. Since the sun has decided to come out, you can now comfortably take the time to really look at your wrap for any potential issues or necessary fixes. Also, you will want to make sure that all of the information you present is up-to-date. This is especially true if your wrap was created to advertise a specific product or event. Need a Vinyl Wrap Touch-Up This Spring? SkinzWraps, Inc. Has You Covered! It may just be time for you to retire your wrap and snag a new look for the season. If so, SKinzWraps, Inc. is ready to give your vehicle the look you want. Get in touch with us to meet the team behind our brand and find out more about designing the wrap of your dreams!